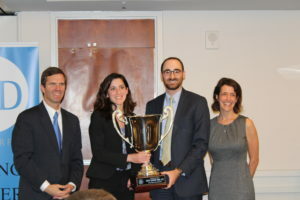 Congratulations to the winners of the 2019 Kentucky Legal Food Frenzy! Trophies will be award at the Kentucky Bar Convention on June 13, 2019. Frost Brown Todd, in Lexington, Louisville, Florence and Cincinnati donated 371 pounds per attorney, 82,365 pounds total. DBL Law in Crestview Hills donated 698 pounds per attorney, 22,325 pounds total. O’Brien Batten & Kirtley in Lexington donated 2,355 pounds per attorney, 11,775 pounds total. Hicks & Funfsinn in Lexington donated 30,508 pounds per attorney, 61,015 pounds total. Office of Commonwealth’s Attorney, 30th Judicial Circuit in Louisville donated 26,408 pounds. University of Kentucky College of Law in Lexington donated 1,170 pounds. Click here for media coverage of the 2018 campaign winners.